SkyWave Mobile Communications (“SkyWave”) is a global provider of satellite and satellite-cellular devices in the Machine-to-Machine (M2M) market. SkyWave's products allow customers to track, monitor and control industrial vehicles, vessels and industrial equipment. Applications include tracking the location of vehicle fleets, monitoring data from oil & gas flow meters and turning on and off pumps. 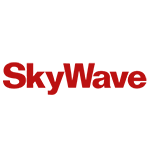 In early January 2015, ORBCOMM completed its acquisition of SkyWave.